(Salt Lake City) - About eight percent of our DNA is viral in origin: remnants of ancient battles between infectious viruses and our ancestors. These so-called endogenous viruses are often perceived as a mere oddity with no clear biological significance. But a new study by scientists at the University of Utah School of Medicine shows that evolution has repurposed some of these viral remains into weapons against its own kind. 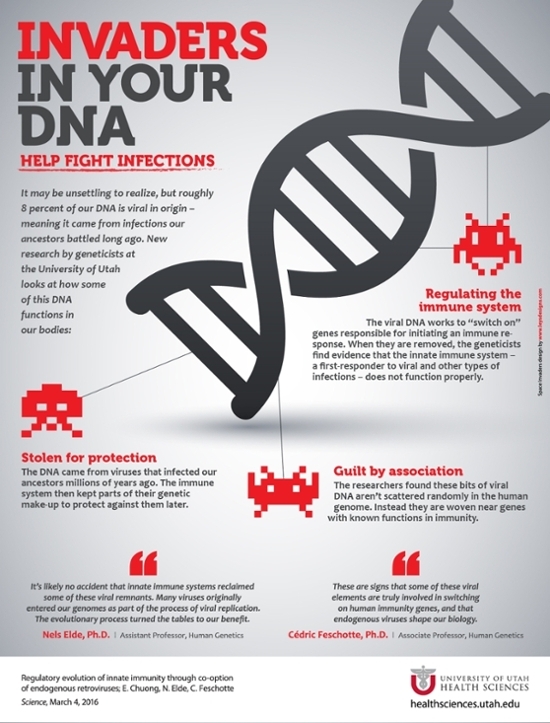 Published in Science on March 4, the scientists report that bits of viral DNA embedded in our genome are regulating genes that are integral components of our innate immune system, the first line of defense against pathogens, including viruses. When some of these bits of foreign code are removed experimentally, the defense system becomes crippled. The human innate immune system’s ability to defeat foreign invaders depends on a well-coordinated response. Upon infection, cells dispatch a silent alarm by releasing interferons, a molecular signal that triggers nearby cells to activate an arsenal of hundreds of genes that fight off intruders. By analyzing publicly available genomic datasets from human cells, the authors discovered thousands of endogenous retroviruses that appeared to be activated by interferons. However, because these retroviruses crash-landed into our genomes many millions of years ago, they have long lost the ability to produce infectious particles. One clue to a potential modern-day function of some of these interferon-inducible elements came from their location in the genome. Instead of being distributed randomly, they were enriched near genes with known functions in immunity. “These were the first signs to us that some of these elements may be truly involved in switching on immunity genes,” says Feschotte who collaborated on the project with assistant professor of human genetics and co-senior author Nels Elde, Ph.D., and lead author Edward Chuong, Ph.D., a Jane Coffin Childs postdoctoral fellow. To test whether the pieces of viral DNA were indeed important for immunity, the scientists used the gene-editing tool CRISPR/Cas9 in cell culture to remove one by one several of these viral sequences, each located near known immune genes. In mutant cells lacking the foreign code the adjacent immune genes could not turn on properly in response to interferon, demonstrating that they act as virus-derived switches. Further, when cells lacking the viral DNA element near the AIM2 immune defense gene were infected with virus, their ability to execute an effective immune response was greatly reduced. Taken together, the results indicate that ancient viral DNA has become important for mounting a proper defense against today’s viral infections. Because similar virus-derived switches are embedded close to many immune genes, the implication is that together they help coordinate our cellular defenses. “The interferon response is like the alarm system of the cell. We found that some of the most important switches in this system are actually derived from ancient viruses,” explains Chuong. The report also finds clues that other endogenous retroviruses may have independently “wired” the interferon responses of other mammals, potentially pointing to a widespread mechanism underlying species-specific immune responses. “It’s likely no accident that innate immune systems reclaimed some of these viral remnants”, says Elde. Immune defenses are continually challenged by pathogens that rapidly evolve and change invasion tactics. In order to keep up, evolution simply retooled the genetic material that was previously supplied by viruses. The research was supported by the National Institutes of Health (GM082545, GM114514, GM112972, GM059290), the Jane Coffin Childs Memorial Fund, and the Pew Charitable Trusts.